Friday, July 8th is our LAST DAY. Come and get it while the gettin’s GOOD! Awesome old galvanized buckets make great planters! You see them in all the decorating magazines. 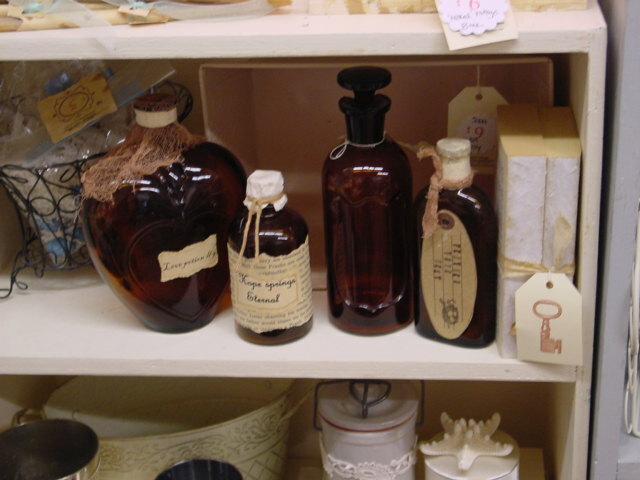 Vintage cloth flour sacks (the REAL thing!) make great shabby pillow covers. 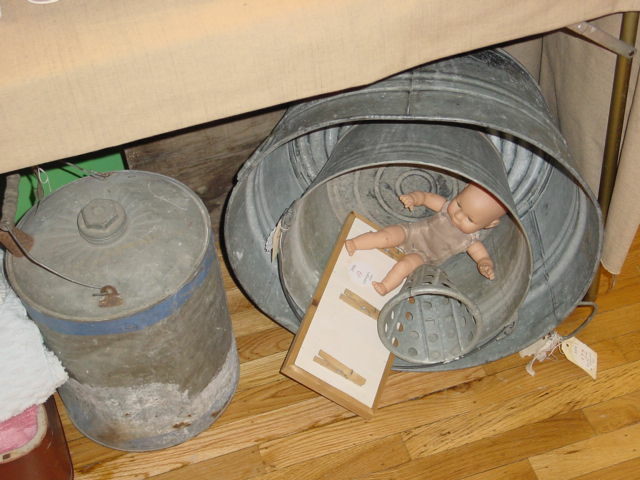 Grubby old gas can, wash tub and old mop bucket with mop attachment! More planters?? I have a big old tub that I like fill with ice and use to chill bottled drinks at parties. 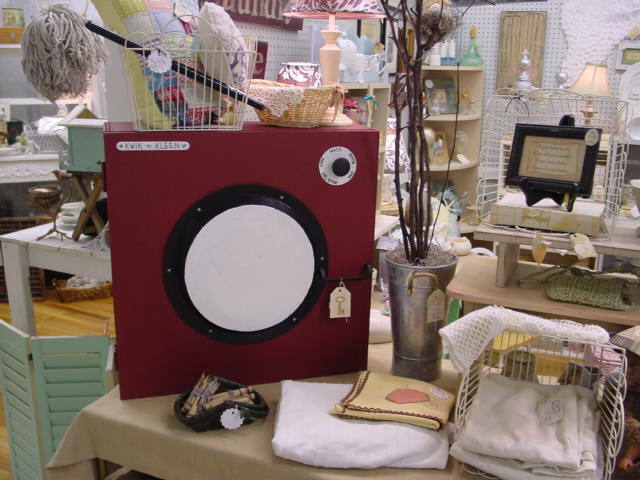 One of a kind, retro style washing machine shelf for the laundry room. Opens up to two roomy shelves for hiding all those laundry necessities. 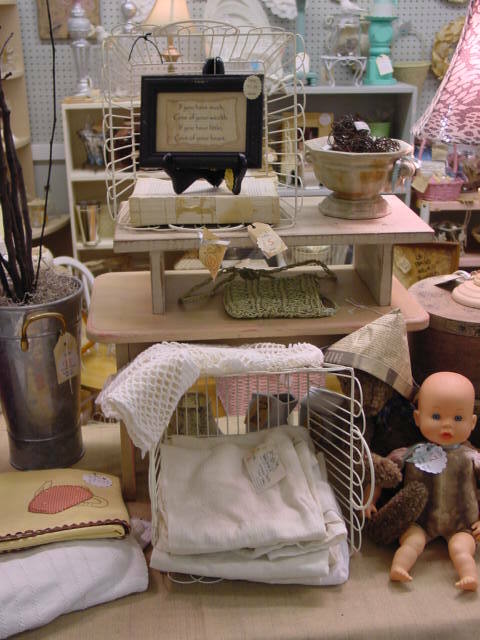 And how CUTE is that little toy mop in the basket on top?? Lots of just about everything still! It won’t go any lower than half price. 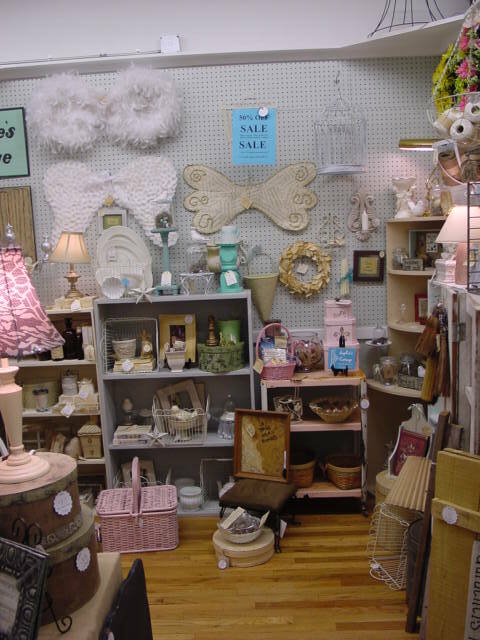 What’s leftover will go back into regular inventory for our space at Stars and the fall show, and back up to FULL price. Rusty old pink metal rolling cart has an electrical outlet even! Pink and rusty just not your style? 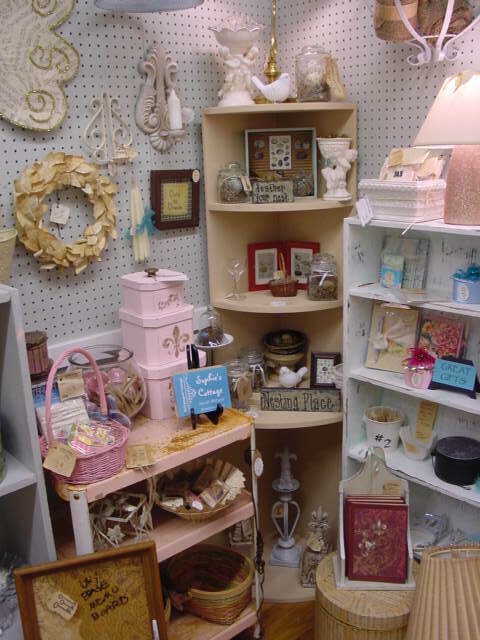 At just $20.00 (half off of $39.00) you can buy some Rustoleum paint and pretty it up so that it IS your style. 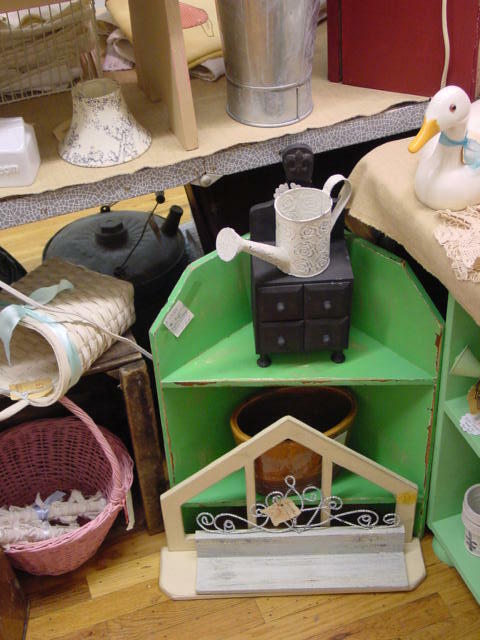 Great ‘craft cart’ and easy to plug in your glue gun! 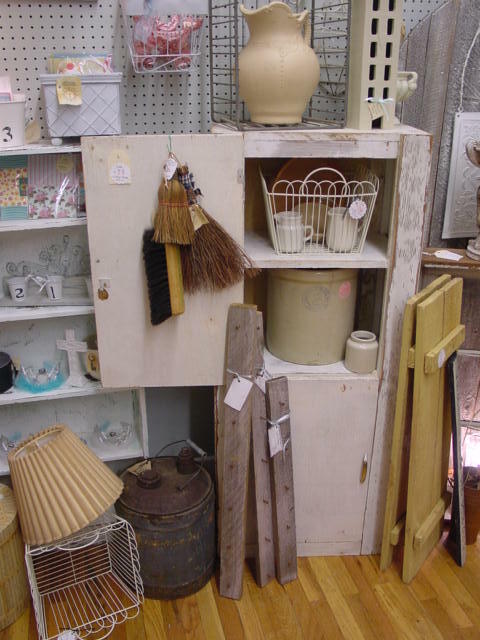 That tan corner shelf is actually TWO separate pieces; a great way to make use of corner space for more storage. Really old kitchen cabinetry, original paint and all! We just ‘cleaned it up’ a bit. 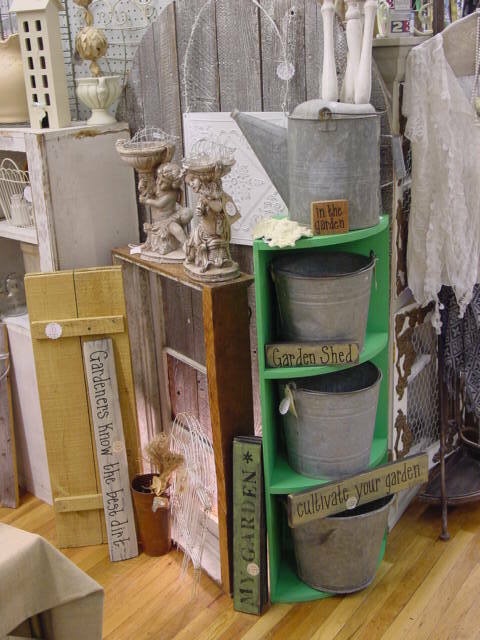 Farmhouse or shabby chic style! 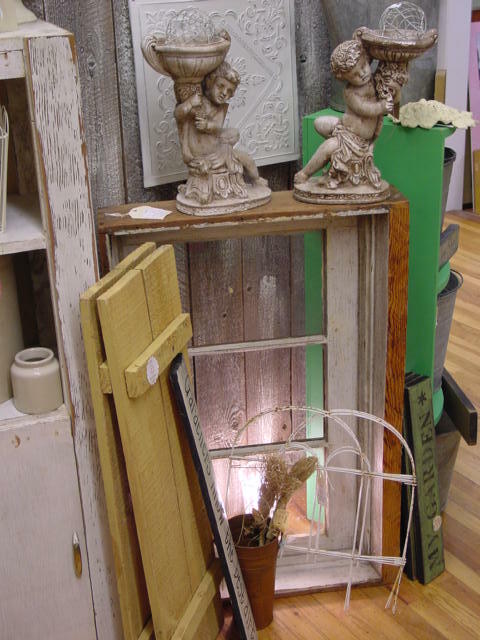 Old window WITH the wood casing! 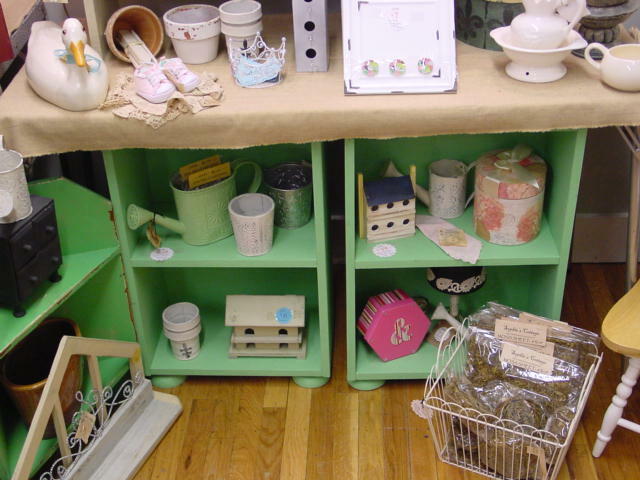 Can you see those cute BUN FEET on these two matching shelves. Make great bedside stands! And, as I said already, if it’s the wrong color for you, at HALF OFF you can afford to buy some paint and fix it up to your liking! 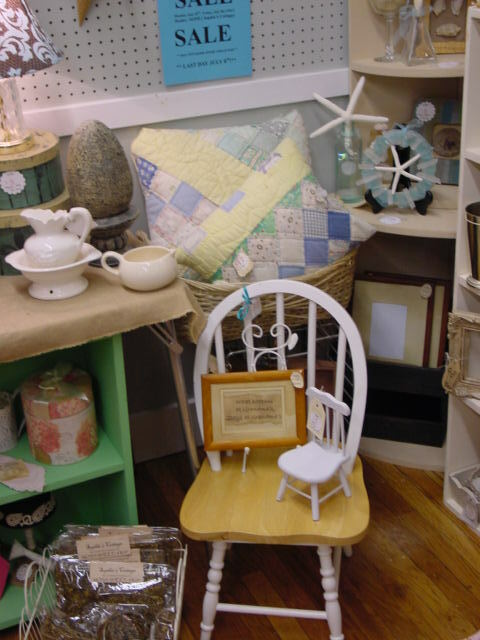 Child size bow back chair. 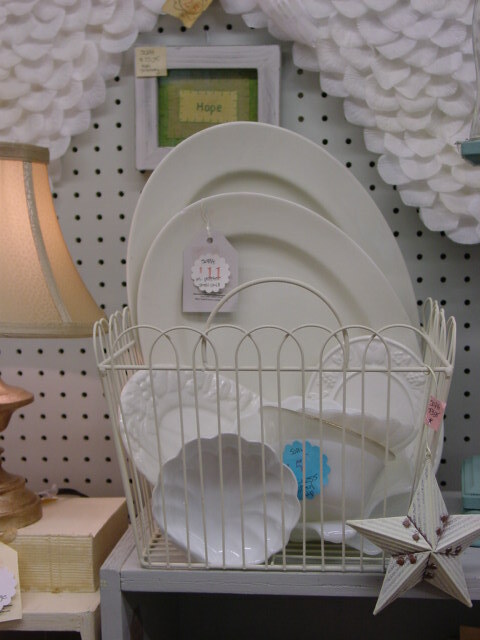 Lots of these white wire baskets at half price (originally $29.00; now just $15.00!). So convenient for storage and display! 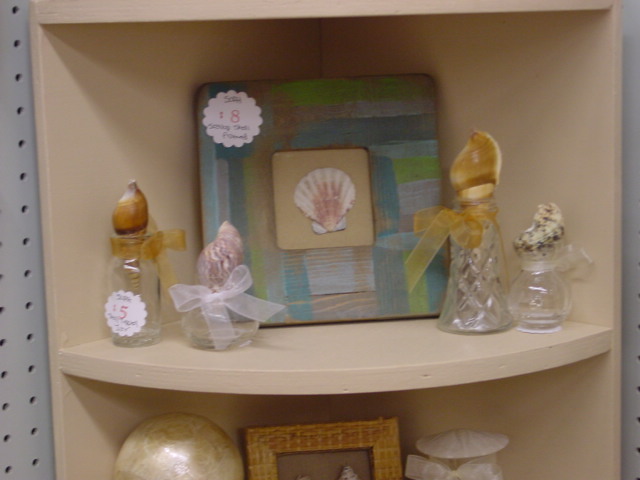 Lots of little beach decor accessories. Wow, lots of great things! I love them all! I wish the shop was close to me! I just moved my blog to WordPress, nice to find you here! I’m going to subscribe! Thanks, have a great day!